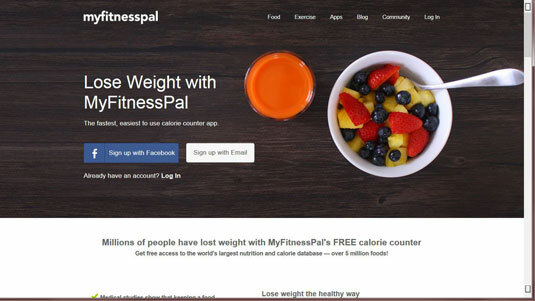 You can sign up with MyFitnessPal either by registering your email address or by linking MFP to your Facebook account. It’s totally up to you if you want to link to Facebook. 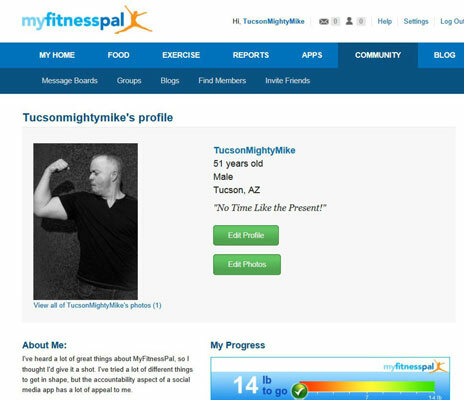 The main advantage is that MFP will find all of your Facebook friends who are also on MFP. You can connect with them for support and camaraderie. You can do the same thing by simply registering your email address without tying into Facebook, you just have to enter or import the friends yourself. Your call — and you can do it later if you change your mind. Either way, you’ll have to fill out a quick form to establish yourself as a MFP user. 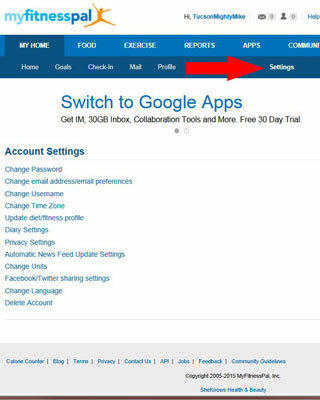 To help develop your individual diet and exercise plan, MFP needs to know some information about you and your lifestyle, such as your height, weight, gender, age, and ZIP Code. 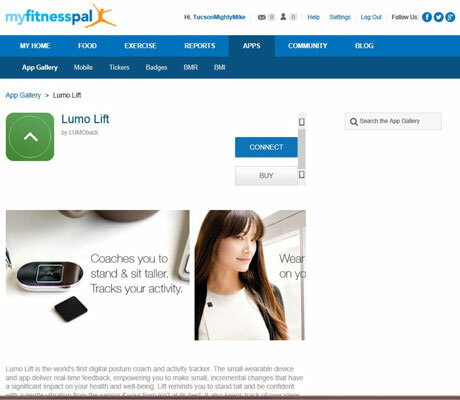 It also asks about your goal weight and your daily activity level. 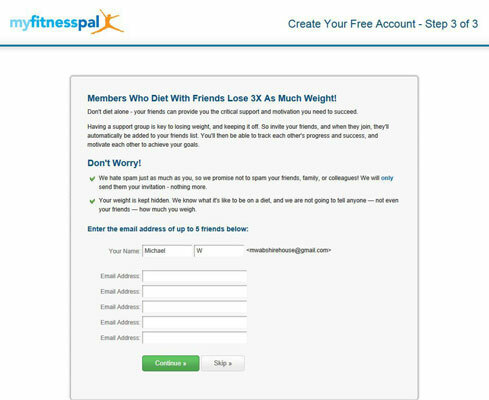 After you click Continue, you can suggest MFP to your friends, since studies show those who have a fitness buddy are much more successful in their quest. You can always skip this for now — it’s easy to add friends any time in MFP. 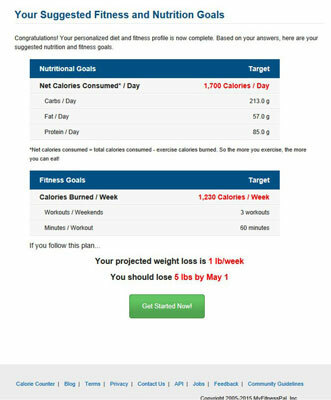 After you’ve completed registration, MFP shows you your suggested goals based on your answers to the registration questions. Depending on how much you’re used to eating every day, your goal may seem really drastic. Only 1,700 calories a day? Yikes! No matter the number, you can do it, and MFP will lead the way. Rather than give you some far away timeline that seems impossibly far away, MFP gives you a friendly guess at where you’ll be in just a few weeks if you stick to the plan. Take a deep breath, then click on Get Started Now to get started now. 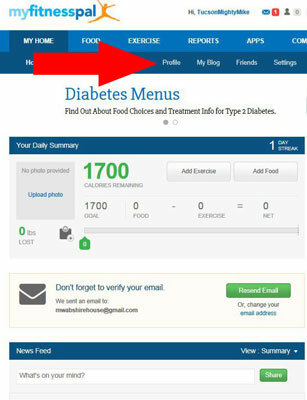 MFP will take you to the Your Daily Summary page, where you can access most everything the application has to offer. What’s the fun of a social media if your profile is blank? Who wants to interact with a brick wall? If all you’re after is the calorie counting, you can probably get by without a profile. 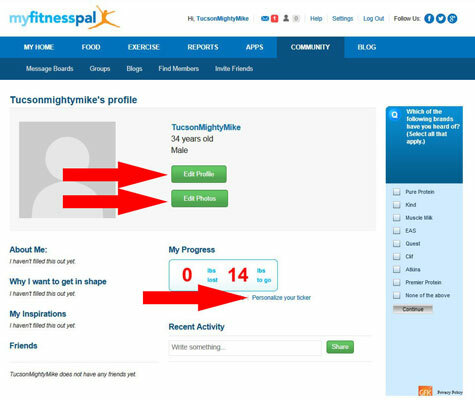 To take full advantage of the Pal aspect of MyFitnessPal, click on Profile in the menu bar to set up your MFP profile. Be real. Authenticity leads to success. Three main profile elements are controlled from here on your profile page. Enter whatever you feels is appropriate here, but you’re more likely to really connect with other people if you’re honest about where you’re coming from and what you’re hoping to achieve. Click on Edit Profile to fill in your responses to the prompts under the photo space (About Me, Why I want to get in shape, and My Inspirations). Click on Edit Photos to add, change, or delete photos. You can post as many photos as you want; this is great when you want to show progress photos. Click on Personalize your ticker to change the way your Progress ticker appears on your profile. You can also update your status from here by typing something in the Recent Activity text box (below the ticker) and clicking on Share. Remember, folks, this is a health fitness program. It’s not a dating site. Appropriate also means being polite and respectful to each other. After you’re done admiring your work, enter your starting baseline measurements so you can track your progress as you lose weight and develop a healthier daily routine. From wherever you are in MFP, click on My Home on the menu bar, and then click on Check-In. 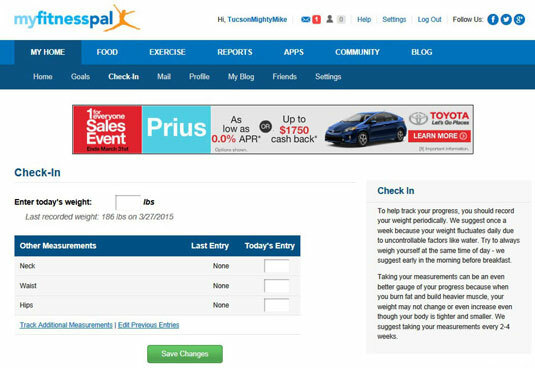 By default, MFP asks to track your weight along with your neck, waist, and hips. If you click on Track Additional Measurements, you’ll find a text field where you can enter anything you wish to track, be it biceps, glucose, mood, or body temperature. Do a weight check-in once a week. Anything more frequent will only be frustrating, as your weight will fluctuate a few pounds up or down day by day. What you really want to see is a downward trend over the course of time. Depending on how much you exercise and/or how rapidly you’re losing, you can track your other measurements once or twice a month. If you have an activity tracker that syncs with MFP, you’ll want to establish that connection before you get too far along. If you don’t have one yet, you can buy one right here without leaving MFP. A few other tweaks you might be hoping to get to are on the Account Settings page. Here you’ll find links to change your password, email address, user name, time zone, and more. You can also adjust privacy settings, change the language or measurement units used for your account, and add or remove the links to your Facebook or Twitter accounts. Or, you can delete the account altogether.